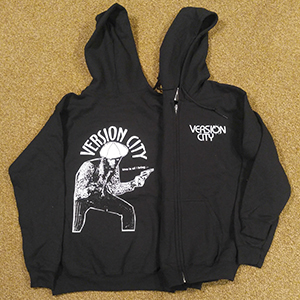 Consistently one of our most popular designs, the back of this sweet hoodie features the long-standing logo of the Version City crew which originated on a poster for the old Version City ska/reggae parties at Coney Island High in NYC. It caught on like wildfire and has since adorned many a flyer, pin, sticker, t-shirt, hoodie and even several of the 45 labels for our Kingston, Jamaica-based Version City vinyl label. The front features the "Version City Dial" logo from the Version City Sessions CD.